The regulatory role of the state in ruling societies has long been an issue discussed by not only politicians but also philosophers and scientists. From Plato to Machiavelli, Alexis de Tocqueville to Lenin, the revolutionary transformation of society and its sustainability was seen as a social goal and an area of both action and discussion. In time, the world perspective and vision brought about by reality/practice were also integrated into this discussion and the issue has been dealt with repeatedly. As a matter of fact, the issue of democracy deserves this attention. The political form of the social environment that we live in is so important and effective that we feel it in ‘each breath we take’. Even if we cannot perceive this form, it does not mean that the political domain occupies less space in our lives. The relationship between education and democracy is dealt with in this ideological framework; and the two concepts will be discussed in such a way that at times their structural aspect will be dominant, while at other times, their operational aspect will be dominant. Yet, no matter which aspect dominates, the interaction between them varies in terms of power, direction, importance, form and results not only from society to society, but also during different periods of the same society. In order to better put through my opinions on the importance of the study, it would be better to emphasize the dimensions of the integrity, one of which is the effort that integrity has been addressed at the macro-micro and national levels, while also involving the global dimension. Natural, demographic, economic, cultural and institutional factors have been studied in terms of their relationship with education. In doing so, the relationship between education and political, economic and religious institutions and the family has been studied. Another aspect of the first dimension of the integrative analysis is that the classroom process has been analyzed within the framework of “democratic education” perspectives and that the study presents some suggestions. In the light of globalization (introduced forcefully), the universality of democracy and human rights, the place of the teacher in the globalization process and bureaucratic socialization are among the topics discussed by the author. Another aspect of the study that reflects its integrity is that, unlike many descriptive studies on education at the beginner level, the views of sociologists and educationists working in the field of “critical pedagogy” have been included. Education has an important place in the development of the individual and the society. It is also important for economy in the provision of labor force. By expanding the place of education in these developments, the educational rights will be transformed into an instrument that produces labor force. Critical thinkers provide a set of concepts that enables us to observe such developments. Critical concept sets provide a guide for teachers, students and parents to actually participate in democratic education discussions. They are also important as a guide for academicians in the field of education regarding discussion topics in which they will observe the effort for individualization and support it, as well as assigning a meaning to the reality. To conclude, Demirbolat’s study is very important as it provides an opportunity for educationists/educators to observe, at a global level, the relationship between social dynamics and the Turkish education system, which the author works in and has had an opportunity to observe closely. Understanding many situations specific to Turkey, which may seem controversial and paradoxical, requires the experiences and evaluations of scientists who observe the situation not only closely but also directly from inside. In this book, the author discusses education and democracy issues within a universal framework; yet, based on these discussions she also successfully provides the international reader with information on the threats to and the transformation of the secular position of education in Turkey. With the framework and discussion dimensions it provides, I hope the book encourages the readers to conduct discussions on the relationship between democracy and education not only globally but also at their national level. I sincerely believe that such discussions are important sources that can create an opportunity for a democratic education. From the perspective of the countries that are undergoing democratization, an important issue is the internalization of the basic principles of democracy by their political actors. Yet, the biggest mistakes are made by administrators, who think that they have internalized these tenets. Therefore, what is understood from democracy in a society – by both the governed and the governing – is of primary importance. A democracy is not an area of liberty with extensive boundaries; on the contrary, it is an area of liberty that has limits. It is not an instrument; it is a goal. A democracy is not the power of a quantitative majority but the power of minorities as well. It is not a regime that can be left unprotected in the name of democracy. Hence it is necessary that the principles and philosophy of democracy and human rights are internalized by all the citizens and the relationship between democracy and education needs to be functionalized. 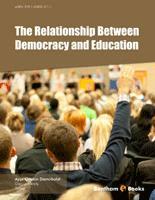 The relationship between democracy and education has two dimensions. The first dimension is about the adoption of the knowledge and awareness about democracy and human rights by all citizens. This dimension stresses the importance of transferring the required information and raising awareness, necessitating the macro-level examination of both the relationship between the state and educational institutions and the relationship between the government, which exercises political power on behalf of the state, and educational institutions. Education institutions are not independent of the ideology of a state, and more often than not, they are not independent of the governments that use the power of the state. Thus, educational institutions are right in the middle of the relations between the state and the government, and whether they are really built towards communicating the knowledge and awareness about democracy or not should be questioned. The second dimension concerns the reflection of the acquired knowledge and awareness onto real life and behaviors. This relationship is observed at the micro level and it involves questions regarding the relations between students and teachers, as well as democratic climate conditions and the characteristics of the environment. Discussions on democracy and human rights at the national level have not been resolved under current conditions; moreover, globalization may yet bring such discussions to a state of deadlock. Instead of being sensitive about just distribution of economic and social rights; global policies pay too much attention to ethnic and religious differences, while overshadowing democracies. Hence, democracies need to be perceived and examined with all the complex relationships at both national and international level. Professor Ayse Ottekin Demirbolat's recent work “The Relationship Between Democracy and Education” discusses interaction of the main concepts of politics and education by considering central social concepts; culture, globalization and citizenship. In that sense, this work will be helpful for further researches about educating democratic citizenship, and it can be a guide for rebuilding of education system on cultural democracy in near future because of its qualified context. Especially in the first chapter of the book role of education with economics, politics, family and religion emphasized and mutual interaction successfully analyzed by Professor Demirbolat. In addition to conceptual discussion, relation between educational and politics institutions analyzed by considering economics, sociologic and demographic doctrines. Although sometimes social science is overlapping and over again issue, expression and wording of the writer is explanatory and informative in this chapter. In Micro-Macro scale, education of individual, citizenship, state culture and political culture conceptualized by considering different stand points. According to this, texture of political culture and its relation with democratic and participating education is successfully examined. Furthermore, education programs, teaching methods and context have to be restructuring on philosophy by considering anthropocentric studies. Professor Demirbolat emphasizes education system has to be more participative, promotive and student centred, in other words in order to introduce democracy culture at school, there has to be a new education paradigm. Participating decision process, individual freedom and right to legal remedies also empathic communication concepts are main themes of this chapter. Additionally, promoting freedom of expression also encouraging independently and scientific thinking are the main expectations of people from the education system. Understanding the logic behind a counter idea, reflecting and critical thinking skills are accepted as main indicators of educating a democratic citizenship by Professor Demirbolat. In the last chapter under the title of globalization. Democracy, human rights and public freedom concepts examined in world wide aspect. Cultural identity, living together with coherence, peace in public and importance of empathy is under debate with wider point of views. In conclusion stage, concepts that examined with main titles in previous chapters are again under debate with more genuine and scientific statement, which achieves beneficial inferences about human rights, democracy and education. I congratulate Professor Demirbolat for her contributions to the social science and intellectual readers. I will be glad to read new works at the same direction from Professor Demirbolat, by using wider databases in the sense of economics and judiciary.